We offer a fun range of full-service dog grooming and spa services to suit your pet's needs, both large and small dogs, and even extra large and extra small dogs too. 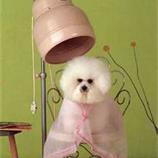 With several packages from a basic bath and nails, undercoat brush-out, up to full clipping or show dog grooming. We use quality pet spa shampoos, conditioners, and deshedding products. Our professional equipment includes a variety of hand-held and stand dryers, as well as timer programmed cage dryers as pets prefer. Fees are based on your pet's size, temperament (behavior), time and staff required, coat length and condition. Additional fees apply if pet is matted or if pet requires flea and tick bathing.